I desperately needed a do nothing day. In fact most of the girls in our group of friends needed a do nothing day. We had all been burning the proverbial candle at both proverbial ends. Charlotte needed to get ready for her lectures the next day, Sophie desperately needed a rest, Trish had to go to the library and take care of some things for her program, and I, well, I just needed to recharge my introvert batteries. I mainly puttered around my room and cleaned up a few things. I did some laundry and of course watched some British TV. The second episode of Downton had aired and I needed to catch up. I had to find out what would happen to Lady Mary and what brilliant one liners the Dowager Countess would bestow upon us. It was a brilliant relaxing day. It was the first day of October. The beginning of the first full month I would be in the UK. I had to get ready early so I could catch the bus to Howlands for our college photo. 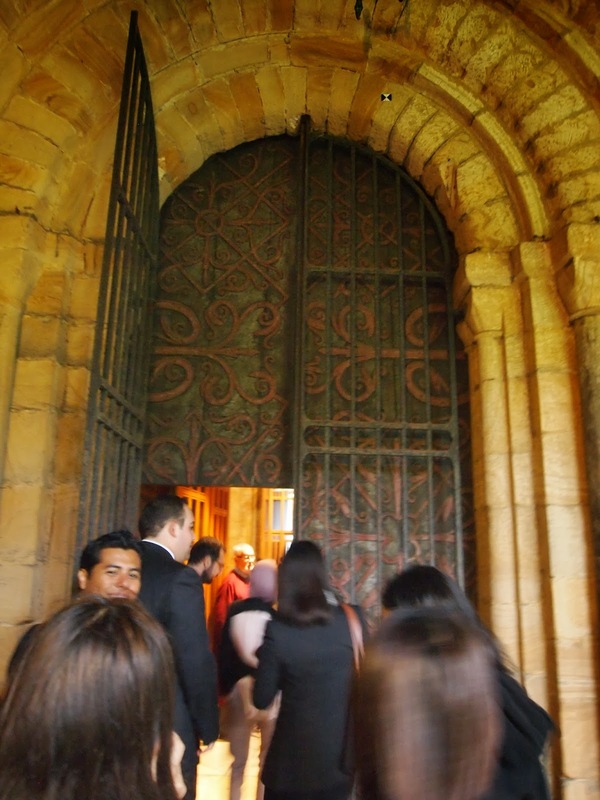 We would then walk to the Cathedral for matriculation. The schedule said to dress smartly. I tossed on my gray suit and my silk turquoise blouse. I brushed my hair and put on my makeup. I was ready. I left my building and very quickly realized how not ready I was. The sky was darkening and the clouds were rolling in. No, no, no, I thought. The weather had been so brilliant all week. It couldn’t rain today for our picture! I went back in and grabbed my umbrella. I ran into Laura who was also heading down to the bus for Howlands. Sam had messaged me the day before and would be joining us as well. We boarded the bus and headed off. It was dreary and began to drizzle. The photo was to be taken outside on steep metal bleachers. I speculated that perhaps they would postpone. Sam laughed, “This is England. We don’t postpone things because of a little rain.” I laughed, too. We met Charlotte, Trish, Elena, and Sophie at Fisher House where we grabbed some coffee and breakfast. Then it was time to head outside. A huge stream of Ustinovians headed for the door. We waited in lines and were told to get into some sort of height order. Laura left for the taller crowd and I realized I was now the tallest out of my group of friends. I did not want to lose them so I bent my knees and tried to think short thoughts. We stood around for thirty minutes in a light drizzle while they slowly arranged rows of people on the bleachers. The rows reached higher and higher and I realized we were going to be near the top. It looked like they were really packing people in tightly. The photographer called out for us to leave our bags on the pavement. We all looked at each other. No way!We weren’t leaving our bags in the rain, on the pavement. Finally it was time to make the climb. The metal was slippery and the stairs were steep. We climbed and climbed until we were three rows from the top. Then we were packed in tightly up against the row in front. I stood between Sam and Sophie. Elena was on the other side. We had become separated from everyone else. We couldn’t move at all. We were so jam packed. It was then that a wasp decided to arrive on the scene. It was like something out of a comedy of errors. All we could do was laugh and hope it wouldn’t land on any of our noses. The photographer took several photos. It seemed he was using an old fashioned camera. He removed a board from the back for each exposure. We were surprised he didn’t bring out a cup of silver nitrate at any point. Finally we were done. 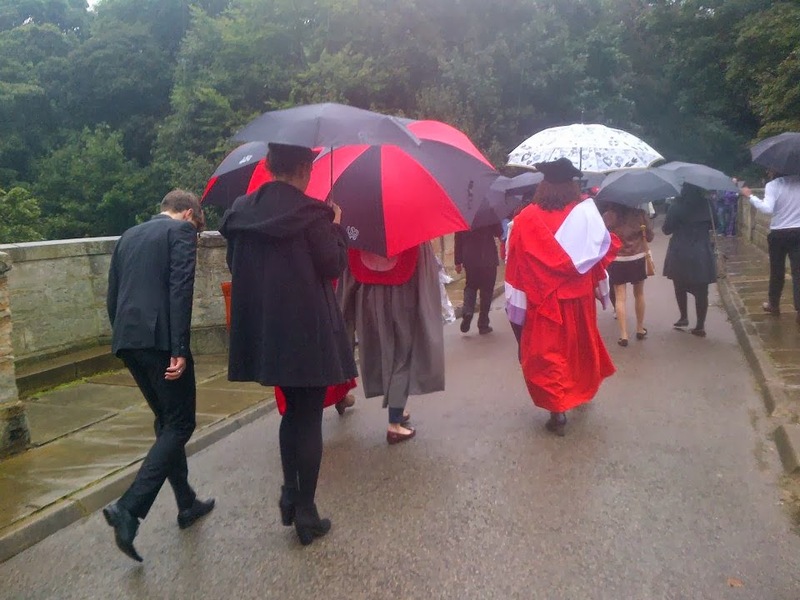 The walk to the matriculation ceremony would be cold and wet. At least we were all together and could make our own fun. 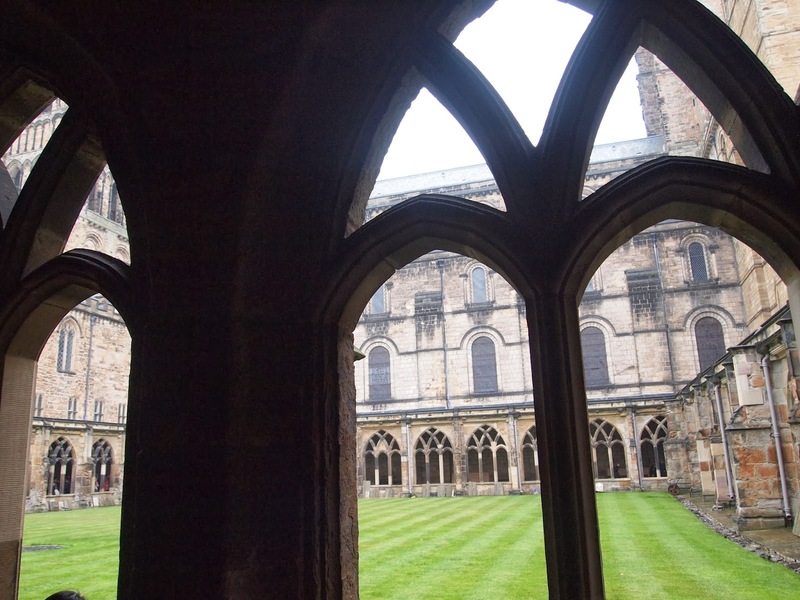 We arrived at the Cathedral and entered the cloisters. Now I’ve made a few Harry Potter references but here is where some of the movies were filmed. 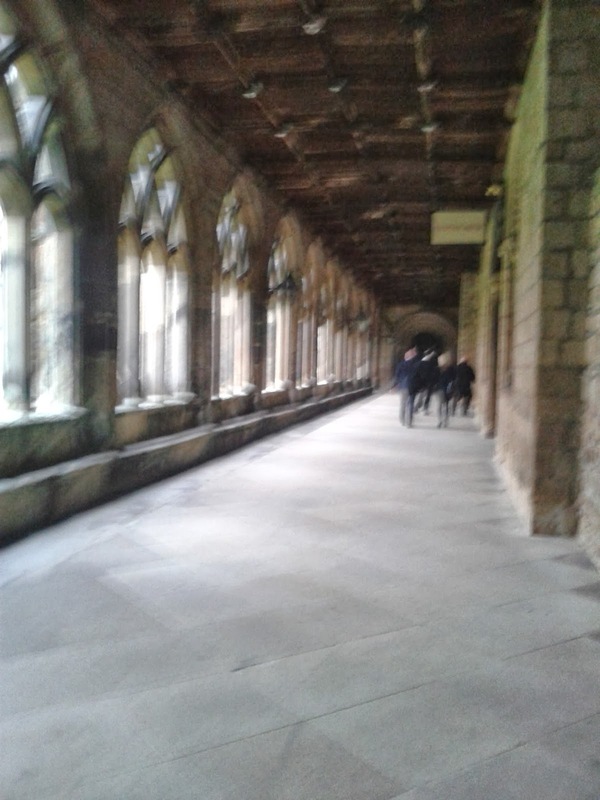 You could see where Ron, Harry, and Hermoine had walked through the cloisters on their way to potions class. It was incredible. 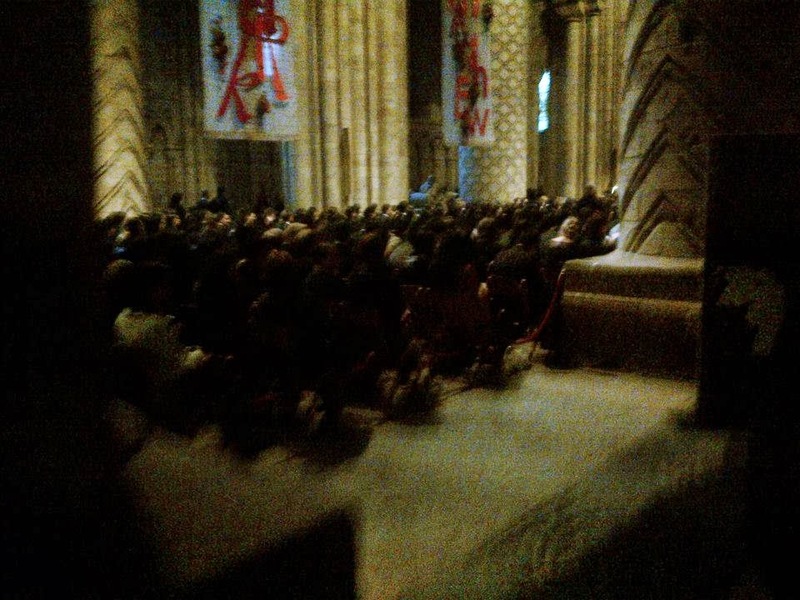 The theme from the films ran on loop in my head as we stood and waited to enter the Cathedral. It was beautiful. Yeah, I go to Hogwarts…..what? 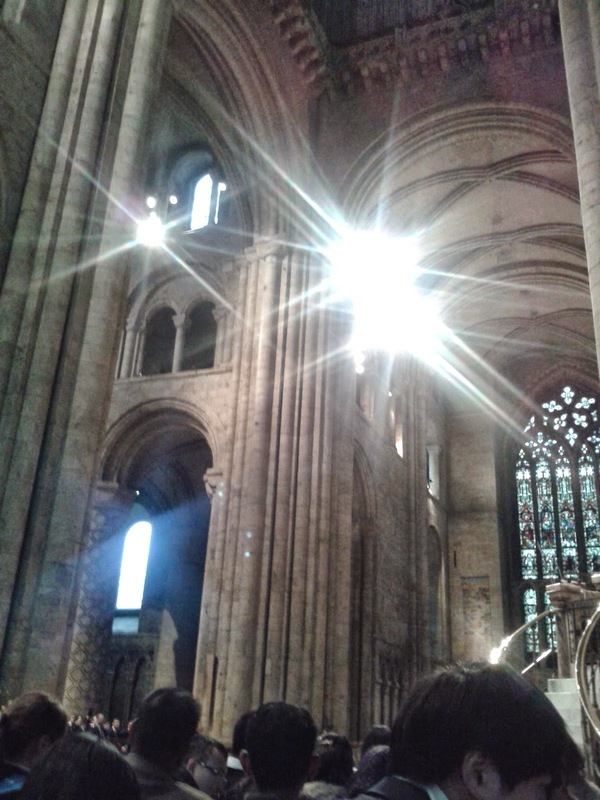 And then I was back in the Cathedral. It was filled with people now. We were shown to our seats and matriculation began with pomp and circumstance. The organ filled the immense space with its resounding tones. I couldn’t see the organist from where I was sitting, but I was reminded of my days as an undergraduate and felt that it was almost the perfect link to the next chapter in my life. The academic procession went up the center aisle. The Vice Chancellor spoke as did the President of the Student Union. Then a representative of our college signed the matriculation book and we were all officially a part of Durham University. We decided to have some lunch to celebrate. Charlotte had to run to her first lecture but the rest of us went on to a pub called Varisty’s. It served American food like burgers. Sam got an apple crumble with custard for pudding and I immediately wished I had ordered one as well. It looked amazing. She allowed me a taste and it was pure heaven. I decided I would go back there soon to have one to myself. Sam, Laura, and I headed back up to our flats. We decided we would try to go to the event that night at Fisher together. Sam would drive us down if she could find a babysitter. I got out of my wet, uncomfortable suit and took a much needed nap. That night we went down to Howlands for Rockabilly night. It cannot be described. I can only hope this video explains it all. 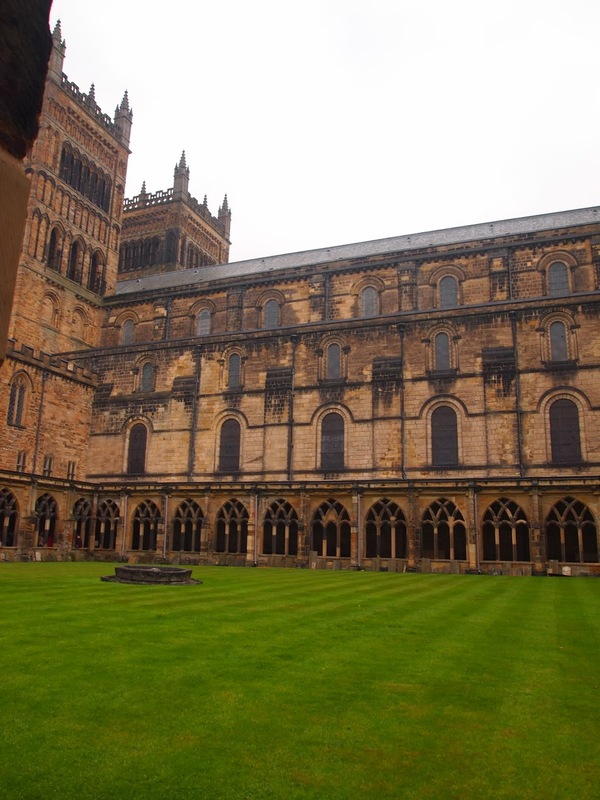 I had been in Durham a full week now. In the span of those short seven days, I had meant some incredible people and seen and done some fantastic and fun things. I could believe how filled up my days had been. Before I came to the UK, I had been unemployed and most days were filled with nothing. It was such a change to be active and interactive. It felt invigorating and I hoped it wouldn’t end. Finally, I could open my bank account. I had waited almost a week and it was the last thing on my dreaded to do list. I went to town and did some grocery shopping first. Then I went to Lloyd’s. The meeting took less than thirty minutes and I walked out of the bank with a checking and savings account. All that was left was to wire some money from my American account and I was good to go. I hopped the bus back up to my room, put my shopping away, and then took another bus back down to the Dawson building. Charlotte and I were meeting with our Café des Arts leader, Ari. We discussed the myriad of upcoming events as well as the choir I was going to try to form. Afterwards Charlotte and I had a pub lunch at the New Inn and met up with Sophie in town. Sophie and I made plans to go to a few museums the next morning. Robin, our course director, had told us at induction we should try to visit as many as we could. We planned to meet Charlotte after her lecture and head into town to pick up some wine for the formal dinner that night. Sophie went back to college and Charlotte and I decided to wander around the Clubs and Societies Fair at the Student Union building. So the best way I can describe to my American audience the many layers of university life is to compare it to our system of government, when it is not shut down of course. Your department (for me archaeology) is like local government. They hold their own events and seminars for archaeology students. The colleges are like your state government. Their programs and events and societies and clubs encompass a range of people in many academic departments. The Student Union is like the federal government. It provides events and clubs for the entire university, all the colleges, and all the academic departments. So the Student Union Clubs and Societies Fair would be open to everyone at Durham University, undergraduates, taught postgraduates, research postgraduates, and PhDs. So you can well imagine it was incredibly packed. We meandered through and past booth after booth. I found the Music Society and managed to get their information. Charlotte found a few that interested her, including free Dominos pizza. (Yes they have Dominos here.) The crowds were getting to me and I was glad to be back out on the street in the cool English air. I decided to head home to another quiet evening. Tomorrow would be the first formal dinner at Ustinov and I wanted to be ready for a fun and fantastic night.